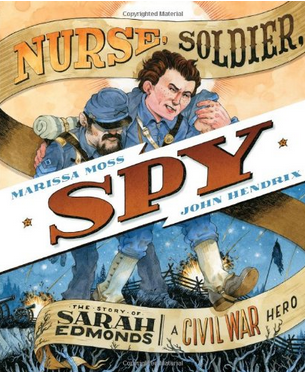 I just read Nurse, Solder, Spy for a nonfiction picture book course and was fascinated by the story of a young Sarah Edmonds who impersonates a boy so she can enlist in the Union Army. Moss writes with the urgency of a war reporter, and Hendrix’s pen and ink illustrations with their blue and gold/orange/yellow acrylic washes suit the era well. the question fills half the spread, bringing home to the reader the awful nature of slavery. In his artist’s note, Hendrix explains that he took some of the typefaces from posters of that era. My son and husband sat spellbound as I read them the story. After impersonating a young man and joining the Union Army, Sarah fought alongside Union soldiers and then disguised herself as a male slave so she could cross enemy lines as a spy. She discovered a Union traitor and made notes about Confederate fortifications and weapons to inform Union leaders once she returned. From the back matter: During the war, she wore different disguises during each of her spying missions, suffered from malaria and was wounded twice but refused treatment so no one would discover she was a woman. In an additional twist to her story, we find out that she left the army briefly so she could get medical treatment for recurrent malaria, and when she decided to return to the army, she discovered she (her male counterpart) was wanted for desertion and was to be shot on sight! So it wasn’t until two years later when her autobiography was published that anyone knew the truth. This young lady was unbelievably brave and finally recognized, through an act of Congress, as a veteran of the Civil War in 1889. Although other women served in various capacities during the Civil War, Sarah Edmonds was the only one ever recognized as a veteran. When her autobiography sold 175,000 copies in its first year (1865), she donated all proceeds from the sales to an organization dedicated to helping Civil War veterans. The author includes additional information in the back matter that adds more depth and complexity to the story. I think this book would be a great read for 3rd graders on up. Older readers could use this text as a springboard for more in depth research. The back matter includes author and illustrator notes and bibliographies as well as a glossary and index. Well done all around! I certainly appreciate a well-illustrated historical PB, and this sounds terrific! If you’ve read “John Brown: His Fight for Freedom,” written and illustrated by Hendrix, you will recognize his signature artwork. I think the illustrations and text (by Moss) in NSS are extremely engaging. War, spying, and the danger of being discovered by either the Confederate or Union armies really amped up the tension. I don’t recall ever seeing Ladybird books. I’ll have to look them up. But I think your parents were brilliant! What a way to keep you motivated! I had the chicken pox, too, and was kept from scratching by reading. Yes, they are also available here in the US. We had a collection as well…loved the British nomenclature like perambulator for buggy or stroller. How has this story not been made into a movie yet? With all the stories told about men and their war experiences, you think this one would be gobbled up. Sounds fascinating. Yes! Yes! Yes! Perhaps we need to get the word out. My kind of story! I love really good historical fiction, especially when it involves very strong protagonists. Sarah was an amazing woman. To think she’s the only known female veteran. I agree with Carrie, where’s a movie or documentary on this remarkable woman? I can only hope that it’s somewhere in development right now. Her life would be a thrilling movie! I’m with Carrie . . . how had this not been made into a movie? Let’s see . . . who should play Sarah . . . how about Natalie Portman. Thanks for sharing! I get dibs on writing the screenplay. I’m thinking a fairly androgynous actress like a young Tilda Swinton, the actress who starred in the film, Orlando. Get to work on the screenplay. Hollywood will come knocking soon. Love this book! I checked out her bio and many books, even recent ones, have included her story…so why hasn’t someone made a movie on this??? Glad she gave all the proceeds to the vets. My 2nd great uncle also was a union spy though I checked to see if they might have connected at any point in the war and they did not, they reported to different generals. Hasn’t it been said that films about women are more difficult to get bankrolled? Perhaps you should write a bio about your uncle? This is a truly inspiring woman. Cannot imagine making that choice in the same situation. I know. I cannot say that I could ever have been as courageous as this young woman. I do think her story should be more widely known. It’s really great, Erik! I think you’d enjoy it! Sounds like a great book, Jilanne! I love stories where girls take initiative! Thanks so much for sharing this one! Yes, and I think her initiative out-initiatives many a young man! Hi Vivian, Nice to meet you, too! Yes, I love PPBF! So many great books out there. I’m taking Kristin’s class right now and really enjoying it. I’m not familiar with Squam Valley. I did attend the Squaw Valley Community of Writers conference for fiction during a week in July. I’ve never run into anyone with my name before. There are many I’ve met with the name Jillian or Gillian or even Julianne, but no Jilanne. Amazing that you ran into two! An inspiring story, hopefully I can find in our library. Thanks for sharing. If your library doesn’t have it, make sure you request it so they can add it to their collection. I’d think they’d be looking for strong female main characters! Thanks for stopping by! Oh, this looks like a fascinating book. I loved “Brave Harriet” by Moss. Thanks for the suggestion! I’ll have to take a look at her other work. Thanks for stopping by! This does sound fascinating. Thanks for sharing it, Jilanne. I have been wanting to read more PB biographies so I’ll add this to my list. I think you’ll like it. Thanks for stopping by! Thanks for sharing this one. It looks exciting and education. I’ll see if my toddler will like it. He’s younger than the older set, but will be a good one for me to read. Stacy, Three things: There are a lot of words in this book, probably 50+ words per spread, some with 150+ words (and 21 spreads), so depending on the attention span of the younger set, they may or may not be able to hang in there with the full story. 2) There are a couple of spreads of battle scenes that may be a bit disturbing for the younger set, soldiers face down on the ground, wounds, bloody bandages, an amputee, etc. 3) I’m not sure that a toddler would understand the significance of slavery, the unusual instance of a woman dressing as a man, and those types of themes, but it always depends on the child. Just want you to know if you were thinking of buying this online before you had a chance to take a look at the book. Thanks for stopping by! My son would love this book. He is big into non-fiction, history, and biographies/autobiographies. He is especially curious about the Civil War as they are learning about it right now in 4th grade. Thanks for this great suggestion! Oh, yay! It is really a very good book. I think he’ll enjoy it! Good luck with your walk. The midnight shift is a tough one! I’d love to see the reenactment, but won’t be able to make it this year. Our school has a big community service project going on that weekend. Have fun! That sounds great, too! BTW, I hope you consider coming to our California Council for the Social Studies conference the first weekend in March. It’s in Oakland this year. It would be great to meet you! Oh, wow! An truly amazing, inspiring story.